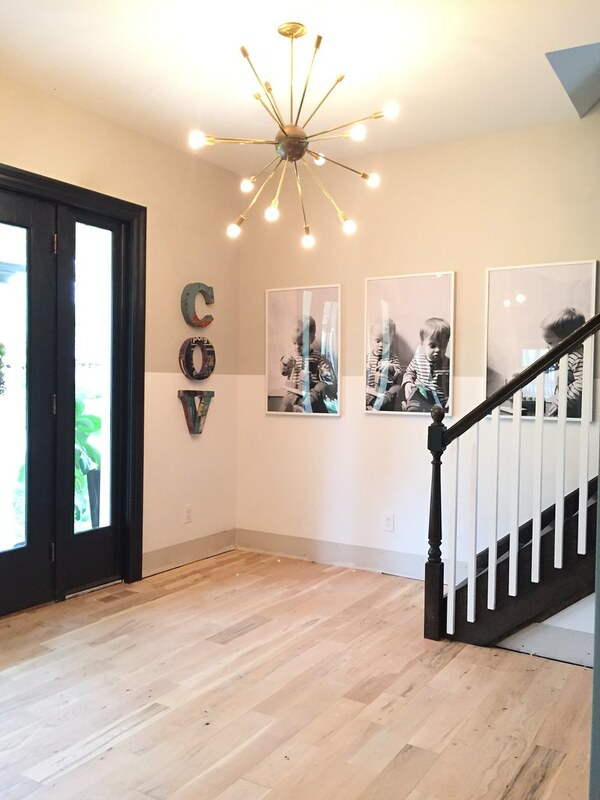 I had two big project goals for 2018—the boys’ room (check out the reveal here) and new hardwood flooring on our first floor. New flooring was a utility need more than anything else. 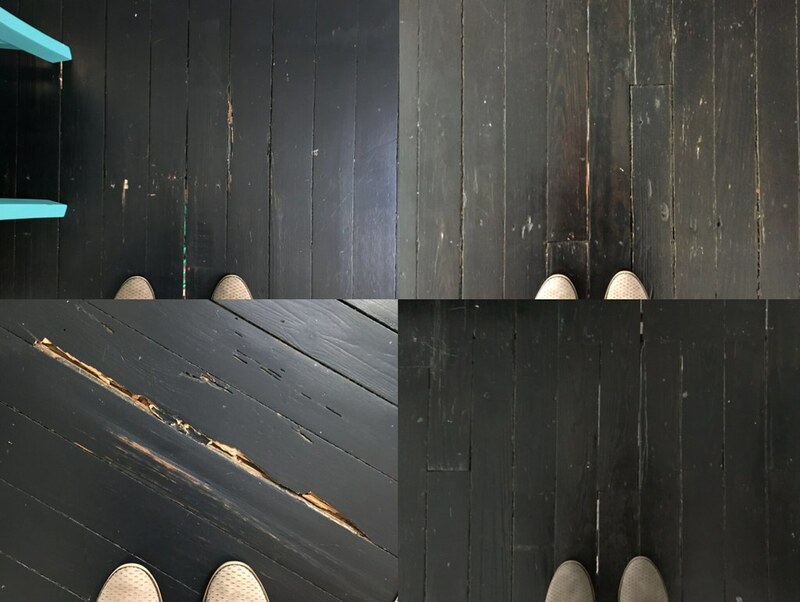 They were drafty as sub-floors were not a thing yet in 1902, the soft pine could not withstand the beating it took from our family and we had several spots that were crumbly and rotting. They had also been stained black and there is nothing more torturous than cleaning a home with dark floors. Truly the job that never ends. Public service announcement: do NOT for the love of all that is holy put dark floors in your home. The constant upkeep required is enough to make your head spin. I have spent far too much time the last 4 years hunched over these black floors sweeping up the dirt and dust. I was ready to be done with it. So anyhoo, let’s get to the point of this post! A behind the scenes look at what happens when you have to move entirely out of your first floor for several days! With 3 kids ages three and under! An adventure that is for sure. We decided to demo our island because we had plans to update it anyways. I also felt socially responsible to the house to install flooring underneath it as I kept imagining the next owners decades from now renovating and saying, “Hey those jerks didn’t do the whole floor!” Ha! 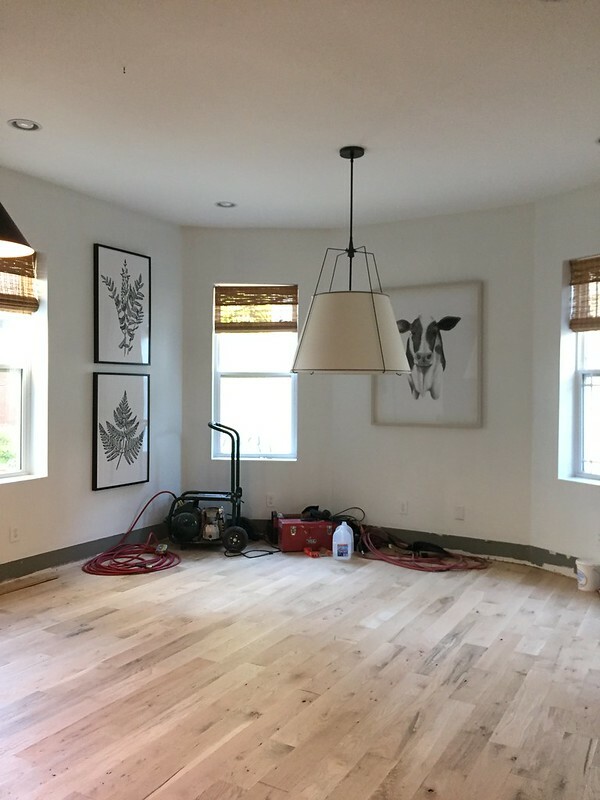 The island cabinets were stored in the basement to be used in the re-build and the drywall and framing wood was hauled off to a construction materials dump site. We turned off the electrical too (obviously!). 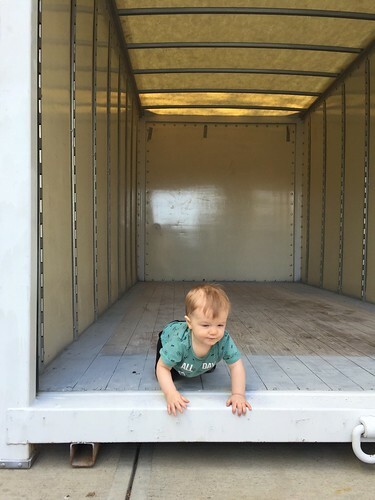 Moving out is the thing I couldn’t quite get my head around as we prepared for this project. It seems like an incredibly daunting task. 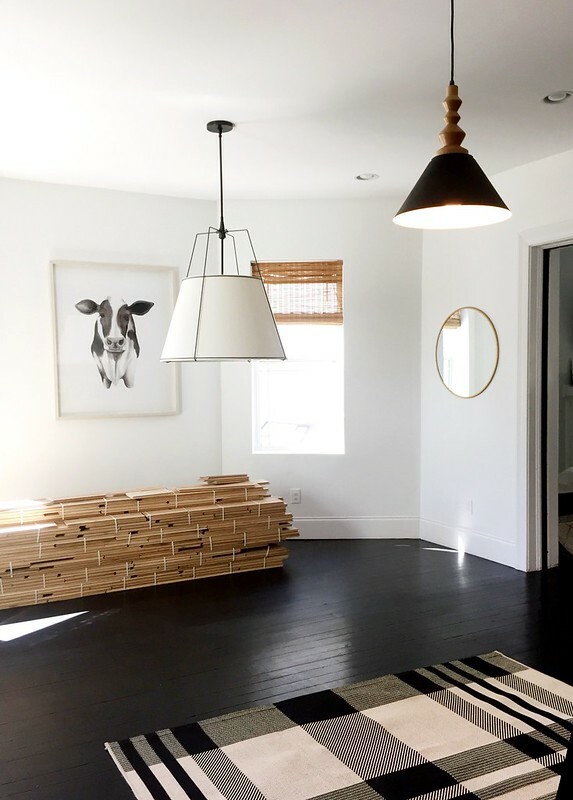 The idea that every piece of furniture, rug, wall decor and all the accessories that come along with that had to be completely removed had me so intimidated. We opted to have a storage unit delivered (from a local Cincinnati company called UNITS which we LOVE!! Thank you Steve!!) and parked on our driveway for a month. I’ve seen others haul the furniture to other parts of the house, but the thought of dragging things up and down stairs and crammed into other parts of our home seemed awful. I needed the upstairs to feel normal to maintain some level of sanity, as that would be our comfort zone for about a month or so. Our driveway was only a few steps away, and very little stairs. 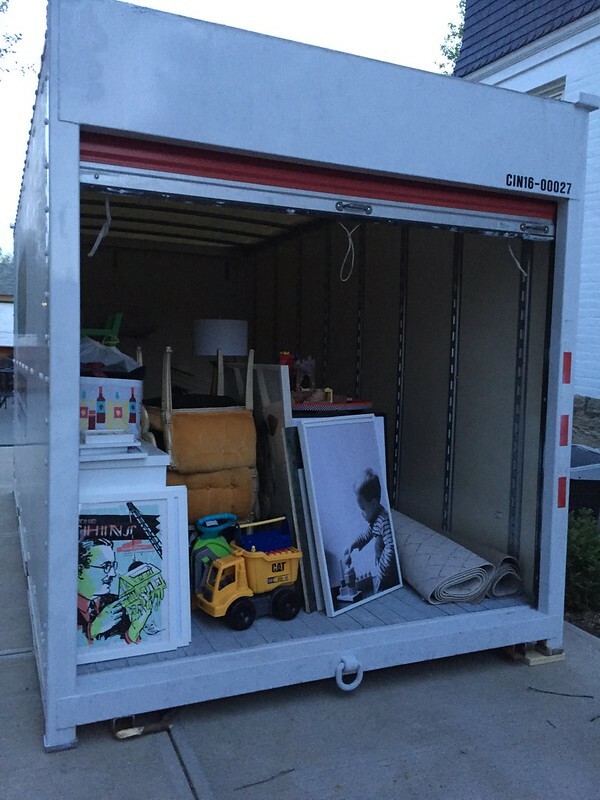 We filled up a 16′ trailer with all of our contents from the first floor. We kept a little walking path down the right side so we could get to the things we needed, if we needed them. I can recall a couple of evenings running to the unit to grab a skillet or pot for Aaron as he was trying to cook dinner! I was worried about the dust too, as I had heard horror stories, but more on that later. It was a good call to remove everything. 6.) And probably the most important, it needed to be within our budget. Some of the above options could be achieved by an engineered hardwood but it meant an enormous cost. We’re talking $11/sq ft for the materials and $2+/sq ft for installation. Nope, nope not happening. Our flooring was around $3.50/sq ft. I would be remiss to not mention the downsides. They are absolutely downsides going the route we went. Engineered hardwood is easier and in many cases, less expensive. But, the advantages above were worth it to us. Downside #1 – It takes a lot longer to do it this way. Engineered hardwoods or even pre-finished hardwoods can be installed in a couple of days. Most folks don’t even find it necessary to move out like we had to. The installers just move the furniture from room to room as they work their way around the house. Furniture can be placed back on the floor immediately afterwards. Downside #2 – The gigantic disruption. Moving out, the length of time post-installation you have to live without heavy furniture while the floor cures, etc. Downside #3 – The fumes! Most of the reason why we were out of the house were the chemical smells. With small kids, this made me the most nervous and why we were out of the house the longest (about 5 days once it had been stained and sealed). Even when we moved back in, it was still somewhat smelly but livable. The other big decision we had to make was what grade of white oak. Depending on the cut, you are going to get different levels of knots and color variation. Or as I like to call it, character. 😉 Between the Common 2 (lots of knots and variation, Common 1 (a few knots and some color variation) and Select (no knots, no color variation) options, we chose Common 2. It was also the least expensive of the three. Here’s a good visual that can explain it better than me! A few days before installation was scheduled, a big pile of hardwoods showed up to acclimate to our house before being installed. We had five piles about this size around the house! They could not put them in one spot because of the weight. Good to know! We had only cleared one space, so we were scrambling to find other places to put them. It took them just two days to install the hardwoods. Even unfinished, it was GLORIOUS to see the transformation. So much lighter and brighter. We were able to stay in the house during this time and the guys were so careful to have everything cleaned up before we returned from work each evening. You can see they also removed the baseboards, which they’d later reinstall on top of the new floors. This is when we got to see all the little details come to life. The integrated floor vents were spackled in. 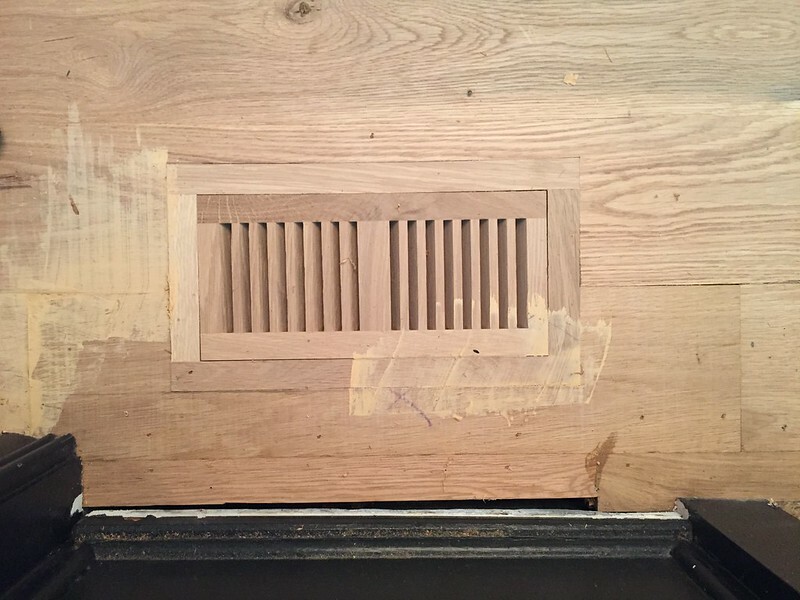 Integrated floor vents are just wood vents installed flush with the rest of the floors. They also get sanded and stained like everything else. 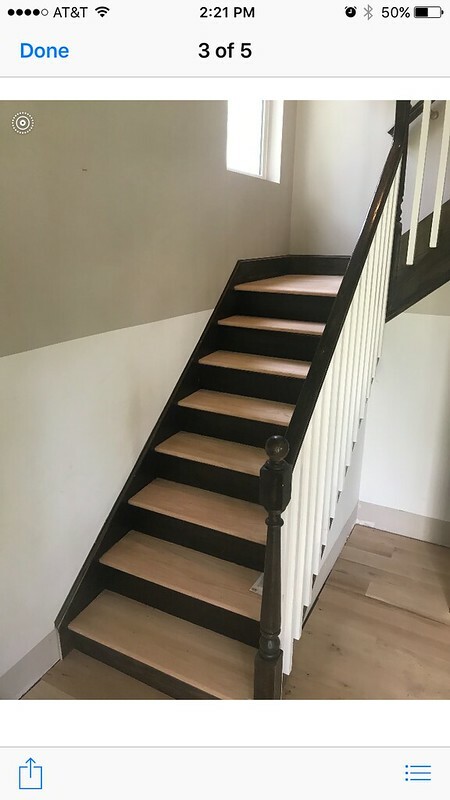 We also had them sand off the old black stain from the stair treads, knowing eventually I had planned to paint the stairs. They had the floors breathe for a few days (caveat: this was back in May so my memory is fuzzy!) over the weekend, then they were back Monday to sand. This is when I got nervous. Aaron and I covered the entire house in plastic sheeting—the cabinets, the entry to the upstairs, etc. (Watch the video below for proof. Ha.) I had heard horror stories. Turns out they use special dust collection machinery and there was barely any dust. When he showed up to my Dexter set that morning, he was like “Uh, you know we use dust collection right?” HA! There was barely any dust to be found. INCREDIBLE!! Because of this we were able to prolong the time we were able to actually stay in the house. I just remember we had to wear socks and be careful of skin contact so there wouldn’t be any oil transfer to the now-raw wood. Now the fun could really begin! Picking our stain color! They brought in multiple stains for me to try, plus some empty buckets in case we wanted a few mixed up. Here is my biggest tip in this whole process. Find a stain color you really like that’s on a real-life object. On a chair, on a table leg, on a picture frame, whatever! 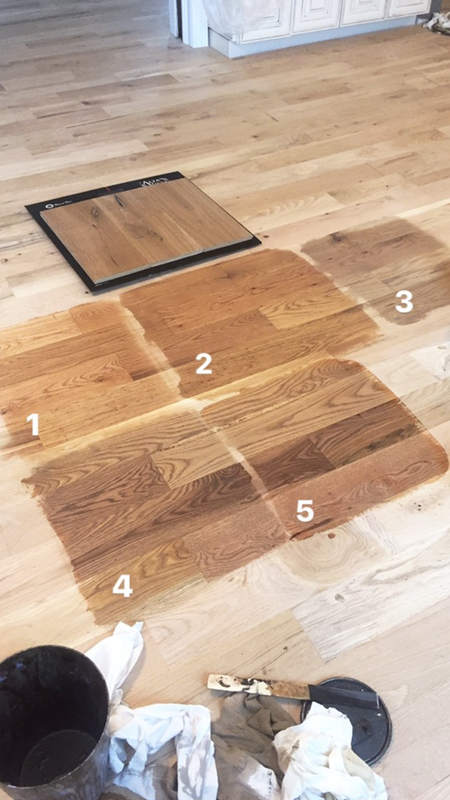 I had a flooring sample from my search of a color that I LOVED, so I used this sample to help guide me in the process. I ended up with a custom color stain that more or less equaled 3 parts Minwax Natural to 1 part Minwax Classic Gray. This is swatch #4 in the picture below. 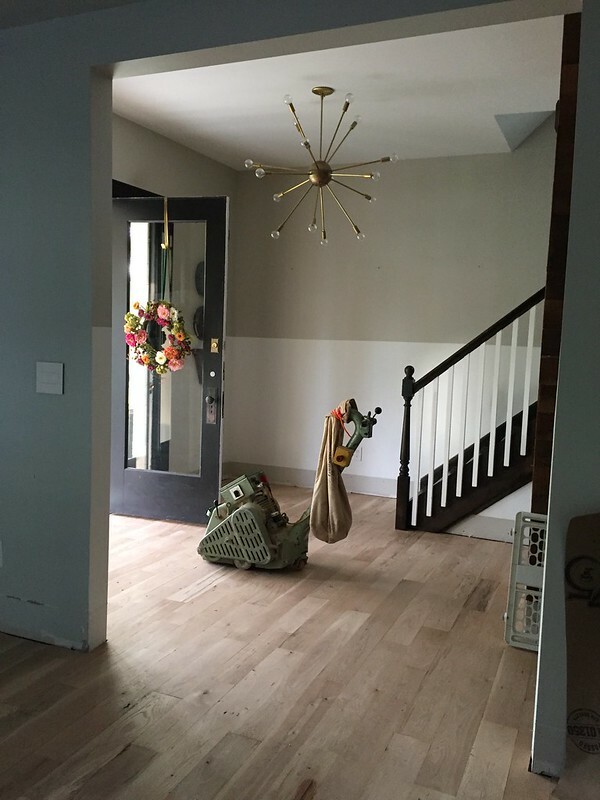 We really loved the raw floor color, but mixed in some gray to neutralize any red, oranges and yellows we were seeing, plus it helped it to desaturate it overall. We picked the color that morning, then we were out of the house for 5 days. This happened on a Thursday. I picked the kids up directly from daycare and drove to my parents house where we stayed until Monday morning. While we were out, they stained over two days, then took a rest day, then came back and sealed it all up. From there, it needed to be totally undisturbed for another 48 hours. We were happy to oblige because it was stinky! If I had to do it over again, I would have asked about no-emissions sealers and stains. Thank goodness it was mild out because we slept with the windows open for a few weeks! Once we were back in, we entered the “no heavy things” portion of the project. For 10 days, we could have no heavy furniture on the new floors as the stain and sealer completely cured. We brought out a blanket (see above) during dinner but for the most part, we spent a lot of time upstairs. I also took some time off work during this part so that I could spackle, re-caulk and paint the floor trim that they had re-installed for me after installation. After we passed the furniture deadline, we mostly lived life as normal except one small thing: NO RUGS! For an additional 22 days (specific, I know) we were to not put any rugs down. This was to avoid any color discoloration that may happen in those early post-installation weeks from the sun. Let me just tell ya… I was happy to have my rugs back. I do remember we went on vacation shortly thereafter and rolled up our rugs before we left for the same reason. 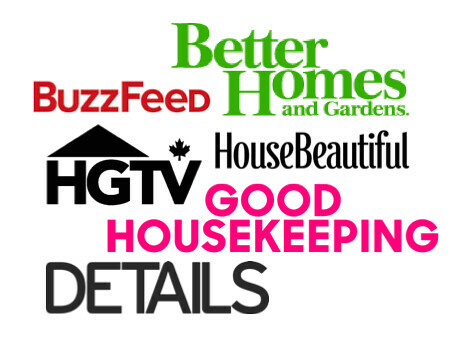 We paid ~$7,300 for this job and we LOVED who we used. Please email me at emkmay@gmail.com if you’d like his name! He was awesome!! 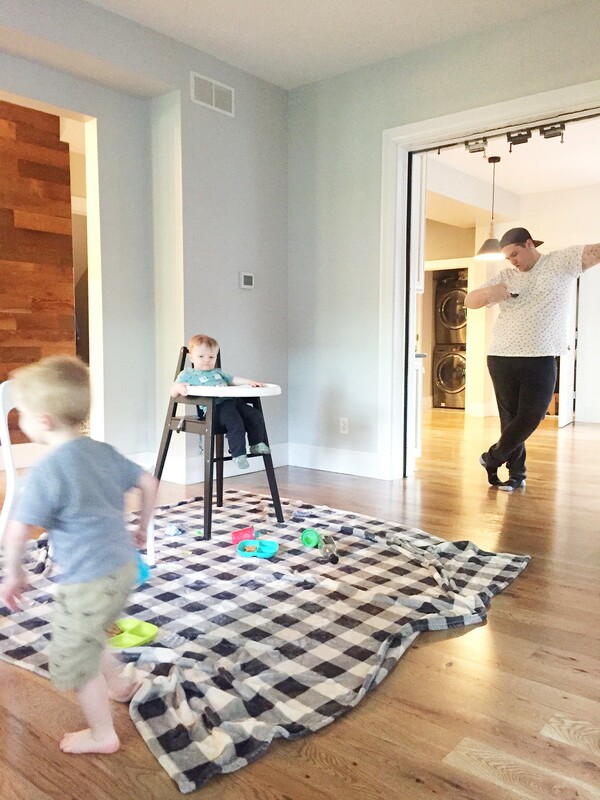 We are 9 months in and absolutely loving the look and durability of these floors.